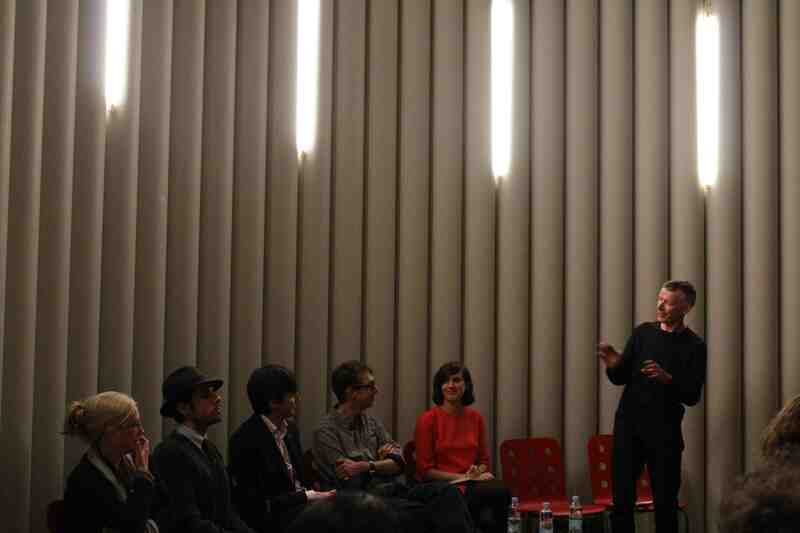 ← Design Culture Salon 15: How does design address immobilities in our society? It is now 20 years since the Disability Discrimination Act (DDA) was passed into law in the UK. This made it an offence to discriminate against people with disabilities in the provision of education, transport, goods and services and employment. And yet, it is more complex than a piece of legislation when it gets actualized. Anyone with an impairment or who has accompanied someone with impairments will know that mobilities or immobilities are complex practices that are experienced in a variety of ways. Yes, it is about straightforward things like ramps and legibility. 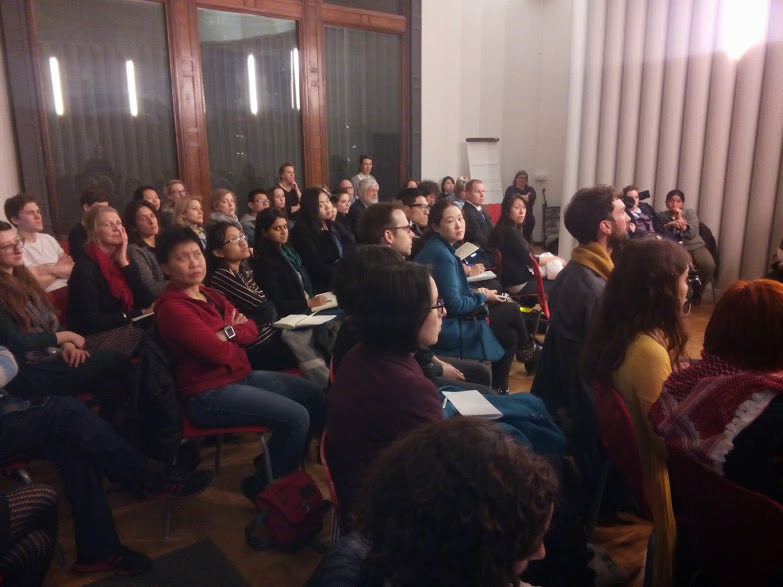 But it also encompasses nuances of language (as a recent edition of Myslexia reminds us), gendered notions of the body, institutional assumptions, the semiotics of materials and a huge range of questions that this Salon revealed. In his introduction to the evening’s discussion, Rob Imrie reminded us that the subject for debate opens onto the politics of design. How society that is designed for and how society is engaged in designing itself provides a register for its priorities. What is considered to be mobility? For whom and how is mobility structured? These issues transform who we are. At the same time, impairment can be destabilized and in that, normative understandings of what this means can be challenged. In her opening position statement, cultural historian Ana Corden-Coyne drew on her research on war veterans of both World Wars. Following WW1, there were some 750,000 returnees who were categorized as disabled and in this environment war pensions were partly calculated on the basis lost body parts. This underlines a view of the body as an assemblage of parts, revealing the historical roots of the cyborg physique wherein lost parts could simply be replaced by prosthetics. In this, the body was conceived around a technological notion of hyper-masculinity. It followed from this that war would not be conceived as disabling; rather, the obstacles to rehabilitation were about ‘willpower’ and ‘attitude’. (In this, I am reminded of my childhood hero, Douglas Bader, as played by Kenneth More in Reach for the Sky; but much of its visual and rhetorical language is repeated in more contemporary representations such as via Help for Heroes.) Needless to say, there were resistances to this dominant system: many disabled veterans threw their unweildy prosthetics away. In this account, though, design has and continues to produce both cultural and social norms of disability that need unpicking. This Salon was devised to coincide with the Shape Arts/V&A artist-in-residence Carmen Papalia‘s productive engagement with the museum. Carmen brings a wealth of experience in performances and enquiries that interface visual impairment with cultural institutions. It challenges the ocularcentricity of places such as the Victoria and Albert Museum by seeking out other channels for engagement. Carmen described how, for example, he has used a sighted companion to describe an art exhibition to him as another way of experiencing it. In this, he made a case for what he calls ‘open access’. This notion takes a fascinating turn from the ‘get round impairment’ school of design, curatorship or museology to challenge dominant, normative assumptions of experience. Open access means that a range of entry-points and registers can be made available and used. Smell, sound, touch, movement, vibration can all be folded into the embodied museum visit for all. Spaces are usually understood and encountered in many different ways, though we allow the visual to dominate. These observations were prefigured by Carmen’s discussion of his cane and how the white cane of the visually impaired became an institutionalising device for him. He has explored this through perfomances in which he has played with the cane to draw attention to its own cumbersomeness and that of the systems of intitutionalisation, or, in an even more spectacular way, by replacing the cane with a marching band as a device. James Grant took the discussion into the important, pragmatic territory of how you address immobilities in a large provider organisation such as Transport for London (TFL). TFL manages the city’s tube, overground rail and bus systems, but also its red routes, traffic signals, cycle hire and congestion charge. Legislation, such as the DDA, sets the standard for what has been designed, but the pressure of campaigners has also been a positive force for TFL. Mobility, James argued, is at the sharp end of what a fulfilled life means, giving access, for example, to jobs, leisure, family and friends and so TFL is vital in this. Involving people with impairments in the design process is important in developing innovative approaches to information, infrastructure and customer services. Sometimes, though, this works on a very slow cycle: for instance, it takes 10 years between instigation, design, production and implementation of a new tube train design. There is a strong sense of TFL valiantly playing a constant game of ‘catch up’ as old infrastructure is incorporated into new systems or design developments and insights get actualized. Decision making runs from the micro-scale of information or device design through to strategizing the most effective points of intervention across an infrastructure. Citing the example of Charles and Ray Eames’s explorations in plywood splints during WW2, Graham Pullin opened out the beneficial transfer of design ideas between domains of design. The Eames’s work for the military fed into design for volume production furniture such as the Model DCW chair. Graham’s personal story was that he left work as a product designer at IDEO to pursue a fascination with speech. He explored issues such as embedding emotion into speech technologies. Likewise, he asked what if we regarded a prosthetic hand really as a hand rather than merely as a tool? How, for instance, would we embed the emotional language of gesture into it? In this he is going beyond the mere ‘design as problem-solving’ notion to pose new questions and speculations that exist on the boundaries, or outside the frame, of institutionalised, received understandings. Can we go further, he later asked, in designing for appropriation? This might be where those with impairments can take on the fashioning and development of objects and environments to suit their needs or wishes. Continuing in a similar vein, Alison Thomson made the case for designers to focus on issues rather than objects. She sees her role and that of other similarly minded researchers and practitioners in what the sociologist Mike Michaels has called ‘inventive problem making’, to reveal previously unthought-of pathways to conceptualizing and addressing immobilities. If, at times, there is a ludic approach here, where play, imagination and disruption play prominent roles in the process, then this distances design from its traditional role in attempting to ‘solve problems’ and, even, just ‘make things work in a be-grudging way’. I think that there can sometimes be a kind of worthiness in designing with disability that results in clunky responses to everyday challenges and, worse still, continues to medicalise impairment. Impairment is sometimes seen as ‘something that can be solved’ rather than something to be explored, engaged and enthusiastically embraced. This is not to belittle straightforward access issues and, indeed, several comments and questions from audience-participants returned to this. At one level, this concerned very specific issues such as the design of overground or tube stations or the interiors of buses. But sometimes priorities have to be decided. James Grant drew attention to the challenge of needing to take strategic decisions in giving attentioin to certain locations over others in public transport. Hence, for example, the extra complexity of making a fully accessible station (Green Park) that was also a hub for shopping and leisure was worth taking on as against smaller-scale interventions. At another level, though, accessibility is also about the emotional experience of a space. Accessible toilets, observed Tony Heaton, Director of Shape Arts, can often be depressingly barren — lacking in any of the humour or delight that they should incorporate. Tony’s hot tip for hotels that provide amazing access in this respect is the Melia Hotel in Berlin, by the way. Access is about step-free environments. But it is also about emotional access. As Rob Imrie argued, it should go beyond a box-ticking exercise on an access statement to incorporate a wider range of modalities. It functions at the symbolic in terms of giving recognition to all participants in a situation. A wheel-chair ramp is a slope but it is also a declaration. We were honoured to have Amanda Cachia from the University of San Diego in the audience. Amanda spoke of how she takes her own portable podium to the public lectures she gives and assembles it as part of the performance. Through she gets the scale of the environment to adjust to her atypical height rather that the other way around. Her podium thus becomes an assertion of selfhood as much as some thing to rest her laptop on. This Salon again demonstrated the richness to be derived in combining participants from a wide variety of backgrounds on a panel. The conversation ranged from the most speculative to the most everyday. While it drew in a few faithful regulars, as ever the theme brought in specialists amongst the audience-participants. We covered a full two hours of discussion and could have gone on. Ultimately, as Graham Pullin stated, design is bigger than designers. This neatly sums up what we’re trying to get to with these Salons. By calling them ‘Design Culture Salons’ we want to reach beyond the notion that design is just done by creative professionals. It is practised in all kinds of ways: in management decisions, policymaking, media representation, specification and commissioning, and in our everyday engagements in the socio-material world. By clustering our attention around a specific issue — such as immobilities — we can begin to trace the relationships and sinews between the material and human constituents that produce, control or disrupt it operations. But I also hope that design culture is seen as something that is dynamic rather than static and that through discussing it we can also open up ways by which we can intervene on it. This entry was posted in immobility, mobility and tagged Alison Thomson, Ana Carden-Coyne, Carmen Papalia, design, disability, Graham Pullin, impairment, James Grant, mobility, Rob Imrie. Bookmark the permalink.